Please enter via the John Edrich Gate, Oval Underground end. 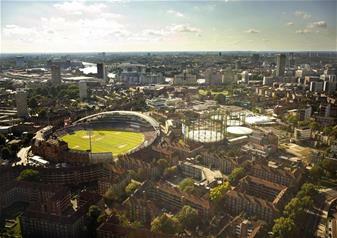 Enjoy a fascinating tour of the Kia Oval, one of the world’s most famous sports grounds. Accompanied by a knowledgeable tour guide, learn more about the Kia Oval ground’s rich history and its place in British culture. For 90 minutes, you’ll get to discover more about the home of Surrey County Cricket Club and the many sporting triumphs that have taken place on the iconic ground over nearly 200 years. Opened in 1845, the Kia Oval ground has a rich history of sporting events. Most famously, it hosted the first England international cricket match in 1990 and in 1993, the always hugely-anticipated Ashes tournament. The Kia Oval has also been the venue for many other exciting sporting events including English football’s oldest competition, the first ever FA Cup final in 1872 and England’s first rugby match in 1876. The Oval has been the home of many of England’s greatest sporting triumphs and most recently, hosted the thrilling finale to the 2005 Ashes. It was also the venue for English victories in the Ashes in both the years of 2009 and 2013! When you arrive at the ground, you will be greeted by an expert guide who will lead you on your exciting tour of the Oval. You will have the special opportunity of seeing all the behind-the-scenes magic of the ground and even get to venture into the press and commentary box. Better still, you’ll get to experience what the hallowed turf feels like! No Oval tour would be complete without going to the Peter May stand giving you breathtaking views of the pitch and the famous Victoria Gasholder. You will also have access to the club museum where you can discover and explore fascinating memorabilia from across the decades. After your tour, you’ll get to relax and enjoy a tea and coffee in the grand Members Pavilion. Once booked, this tour cannot be cancelled. You can amend the date of this tour after booking. On the day of your tour, we recommend arriving at the John Edrich Gate (Oval underground end), 20 minutes prior to the start time of your tour. All tour routes are subject to availability and subject to change.